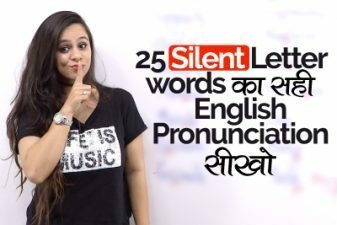 In this English speaking Lesson (explained in Hindi) you will learn some important Adjectives in English which are used for daily English speaking/conversation. Sonia – English teacher has explained the meaning of each adjective and give example sentences that you could use in your daily English speaking. Learn these sentences and speak fluent English. आज के इस इंग्लिश लेसन में आप सीखेंगे कुछ इम्पोर्टेन्ट अडजेक्टिवेस जो हम अक्सर use करते हैं हमारी रोज़मर्रा के इंग्लिश कन्वर्सेशन में. सोनिआ – इंग्लिश टीचर आपको हर एक एडजेक्टिव का मतलब समझाएगी एंड उसे इंग्लिश सेन्टेन्सेस में कैसे use करना हैं वह बताएगी. He is popular in college. Apps are very useful for everyone. I need some effective medicine for my cold. My little sister is dependent on me. She is a very patient person.